Bhutan is perhaps the one of the few pockets remaining of adventure destinations hithero untouched by modernization – A Shangri- La. Situated in the Great Himalayan range; it is bordered by Tibet in the north and to its south by India. As a purely Buddhist country, it has a rich and unique culture, tradition and way of life which still remains pristine. Travelling in Bhutan is like being transported back to medieval time and age. This is an introductory trip to Bhutan taking your to Paro and Thimpu. It is highly recommended as an extension trip to Tibet, Nepal or Sikkim. The sights of the various dzongs, the colourful people, their rich and unique cultural heritage and religious practice will simple baffle only discerning adventurer. This is an adventure trip taking you as far as Tongsa and Wangdiphodrang besides visiting interesting sights of Paro and Thimpu. On this trip you will encounter the glory of the pure and exotic land, ancient dzongs or fortress, monasteries and temples that dot the countryside, its imposing architecture and superb art. 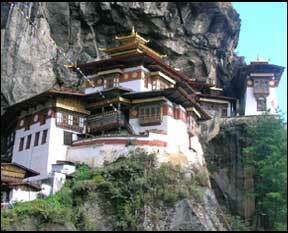 This is a complete tour of Bhutan taking you to the sacred valley of Bumthang. This trip offers spectacular views of virgin mountains, lush forested valleys, rhododendrons, ancient fortress, monasteries, temples, and rich diverse culture and traditions. A short trek in Bumthang will acquaint you with the life of the simple folks bringing you close to nature, peace and solitude.